Texas' Jonathan Holmes, second from right, celebrates with teammates after making a buzzer basket to end the second half of a NCAA college basketball game as Kansas State' Thomas Gipson (42) walks off the court, Tuesday, Jan. 21, 2014, in Austin, Texas. 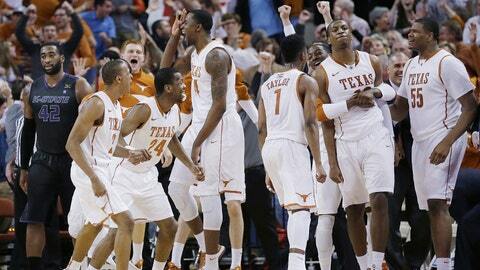 Texas won 67-64. AUSTIN, Texas (AP) — Jonathan Holmes made a catch-and-shoot 3 pointer at the buzzer to send Texas to a 67-64 victory over No. 22 Kansas State on Tuesday night, the Longhorns’ fourth straight victory in the Big 12 and second in a row over a ranked team. Texas had almost blown its chance for the game-winner when it nearly botched an inbounds pass with 3 seconds left. But after a quick timeout, Isaiah Taylor zipped the ball to the Holmes in the left corner and he put up the shot over two defenders. The ball swished through the basket at the buzzer and Holmes was mobbed by his teammates. Javan Felix scored 23 points to lead Texas (15-4, 4-2) and Cam Ridley scored 18. Holmes finished with 10 points. Thomas Gipson scored 24 points for Kansas State (14-5, 4-2), which had tied the game at 64 on Shane Southwell’s twisting, off-balance layup with 5 seconds to play after Felix had missed two free throws. The Longhorns, a team with no expectations in the Big 12 when the season started, continue to build confidence and look more dangerous for the league heavyweights every week. Holmes and Ridley have been a powerful combination in the run of victories, delivering both muscle and big shots when the Longhorns need them. Against Kansas State, Ridley was locked in a game-long tug-of-war under the basket with Gipson as those two pushed and shoved each on both ends of the court. Holmes scored eight of his 10 points in the second half. Ridley had 12 points and five rebounds in the first half. Felix scored 10 in the half and put Texas ahead 36-30 with a floating bank shot with 1 minute left. The Longhorns had a chance to push the lead to eight before Ridley was whistled for an offensive foul. Gipson kept the Wildcats within four with a layup as time expired. Kansas State grabbed its first lead of the second half at 52-49 when Southwell made two free throws and Wesley Iwundu made a fastbreak layup. Felix briefly restored Texas’ lead with a baseline floater — his first points in nearly 6 minutes, before Southwell made a 3-pointer that started a flurry of back-and-forth lead changes and ties. The game looked headed to overtime after Southwell’s tying layup with 5 seconds left. Texas got the ball to midcourt and called a timeout. On the inbounds the ball went to Demarcus Holland, who didn’t know what to do with it, forcing Texas to quickly call another timeout. Given another chance, Taylor whipped the ball to Holmes for the final shot.